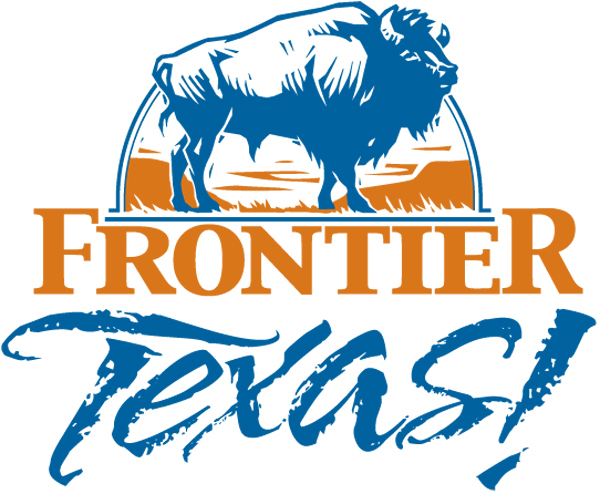 Frontier Texas welcomes all journalists and advertising media to use our logo and images for editorial and promotional purposes. 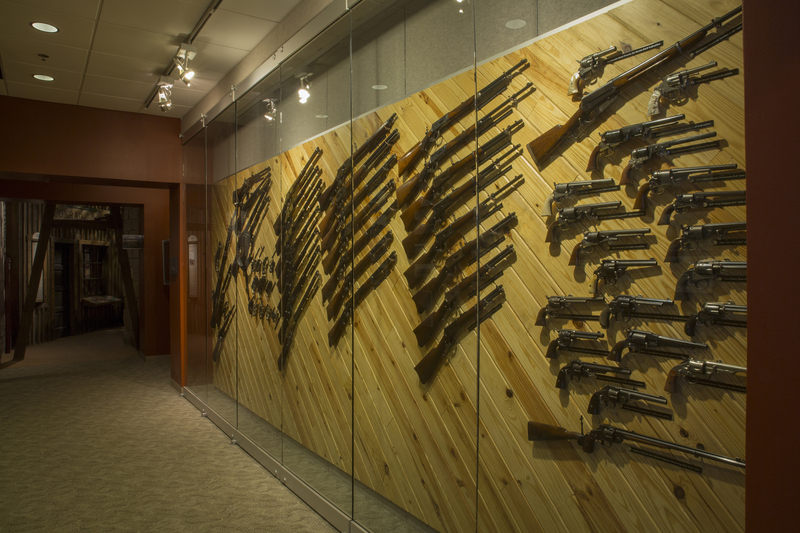 For additional assistance please contact our museum staff at (325) 437-2800 or email info@frontiertexas.com. 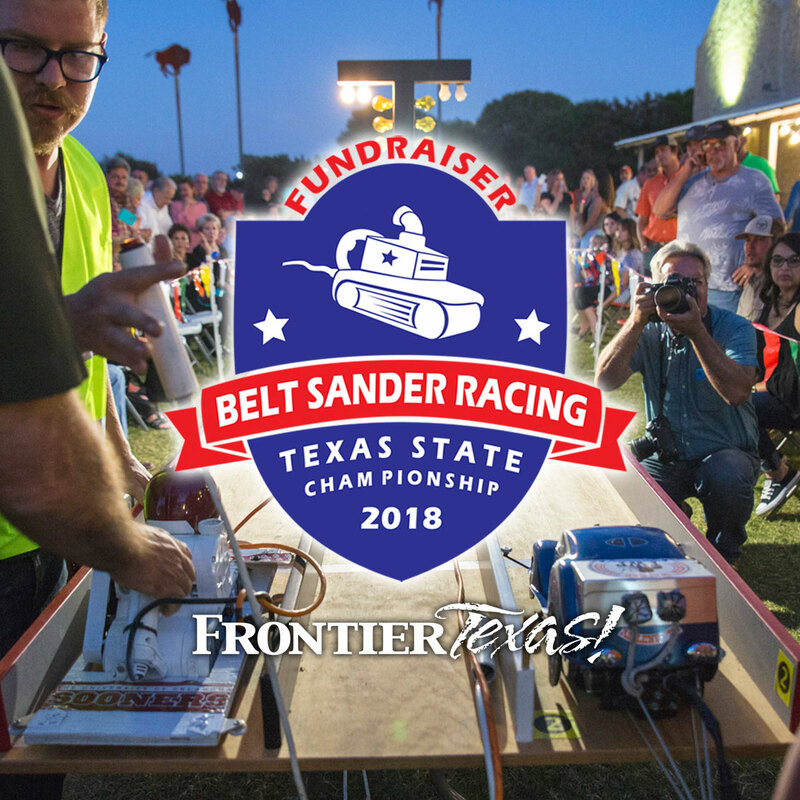 MEDIA BACKGROUNDER ON FRONTIER TEXAS! In the same way that Texas’ early frontier forts established a protective gateway at the edge of western civilization, Frontier Texas! establishes itself as a welcoming gateway at the limits of downtown Abilene. An important component of the continuing revitalization of the downtown area, the project functions both as the “trailhead” for Abilene and the Texas Forts Trail and as a destination in itself. One wing of the building is a Visitors Center for the City of Abilene, for the “Big Country” region of west Texas, and for the Texas Forts Trail, a 700-mile heritage tourism loop which starts and ends in Abilene. The larger part of the building is an audio-visual and interactive center. Cowboys and longhorns, soldiers and forts, Indians, the buffalo trade, and vignettes of frontier life from 1780-1880 round out the Frontier Texas! experience. The century of 1780 to 1880 was selected in order to limit the scope, but also because it was a time of change. This period began about the time in which the Comanches, the first “horse Indians,” pushed other Indians out and became the dominant population of this region. Conflicts were no longer just tribal; they encompassed Europeans who were attempting to move into the region. The century ends just prior to the railroad crossing west Texas, a development that provided last rites to the frontier environment. Our Trail Guide through the experiential portion of the facility is Buck Taylor. Buck (the audio-visual narrator) is a former star of the Gunsmoke television series as well as numerous western movies. He will explain what is being shown in various segments of the historical experience. 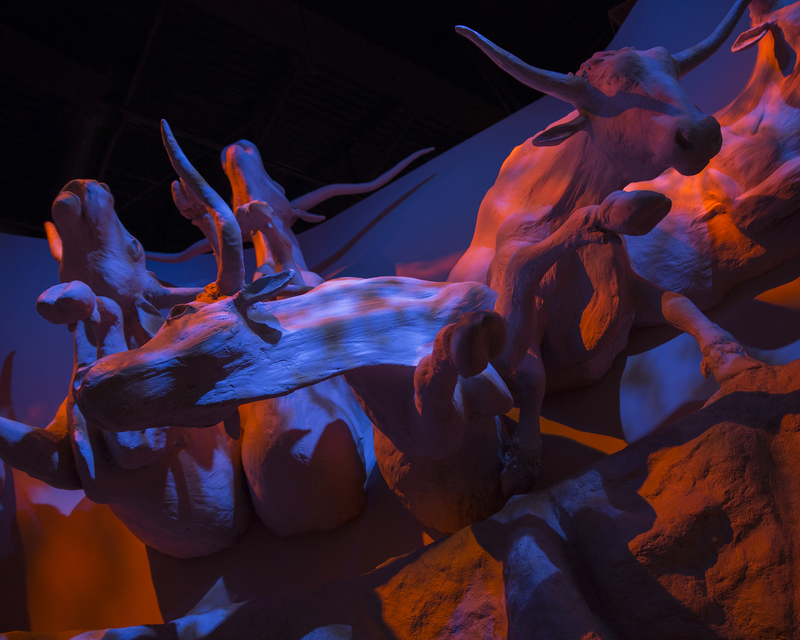 In the Welcome Theater, Buck introduces visitors to the Spirit Guides found throughout the facility. The Spirit Guides are eight individuals who have been selected to represent different segments of the frontier population, who return from the spirit world to help visitors today understand what their time on the frontier was like. On a large projection screen and two 30” plasma screens, visitors will be given a consolidated history of this 1780-1880 adventure. In less than five minutes, an overview of the people, events and situations of the century on the frontier will be reviewed. This map shows the influence of topography on inhabitants of the Texas frontier. The map covers the area from Ft. Worth on the east to the Cap Rock on the west, from Indian Territory on the north down almost to San Antonio. The fiber optic button bar allows visitors to light up areas of the map, including routes of explorers, cattle trails, encounters with Indians, lines of forts, buffalo trading posts, and towns that existed before 1880. This mural must be one of the largest paintings in the world, being 12’ high and 416’ long. It serves as a background to tie the physical exhibits together and to create mood, as well as reflecting changes in seasons and time of day. It was painted on canvas in sections, then mounted on the walls. The paint is a type of acrylic. This is an actual-size tipi that follows the style of the Comanche and Kiowa tipis of the 19th century. From the middle of the century on, it was not unusual to find canvas tipis among the traditional buffalo hide lodgings, as Indians could barter for the lighter weight material from Comancheros and other traders. Inside, visitors can draw their own pictographs. In 1872, three men camped for the night between Comanche and San Saba were attacked by a band of about thirty Indians. The men shot and killed the chief and four warriors and managed to escape in the chaos. They returned at daybreak with reinforcements to find nothing but the graves of the five Indians. On top of one grave was a dead horse. A rope around his neck was connected to the chief buried below. Among his weapons was his buffalo-hide shield adorned with the three women’s scalps, shown in a display. References to the frontier forts are imbedded throughout the historical experience and the various film segments. Dimensional exhibits also feature Ft. Phantom, where visitors witness an Indian attack on soldiers; Ft. Chadbourne, from which Randolph Marcy answers the viewers questions (via light and magic) about the military on the frontier; Ft. Concho, set as the base for Buffalo Soldiers on the Texas frontier; Ft. Griffin as the fort adjacent to the notorious town of The Flat; and Ft. Belknap, as the home of frontier hero Britt Johnson. This is a touch screen computer located in the Flat area. For the visitor with time and interest, it offers a vast amount of information on various topics. The information is divided into four sections as shown below. Communication has three sections: “Dictionary A-Z,” “The History of Indian Signing,” and “Making Sentences.” Here you can find everything from instructions on how to ask questions in sign language, send smoke signals or make pictographs. There is also a section on military uniforms, bugle calls (with musical notation) and cowboy jargon. 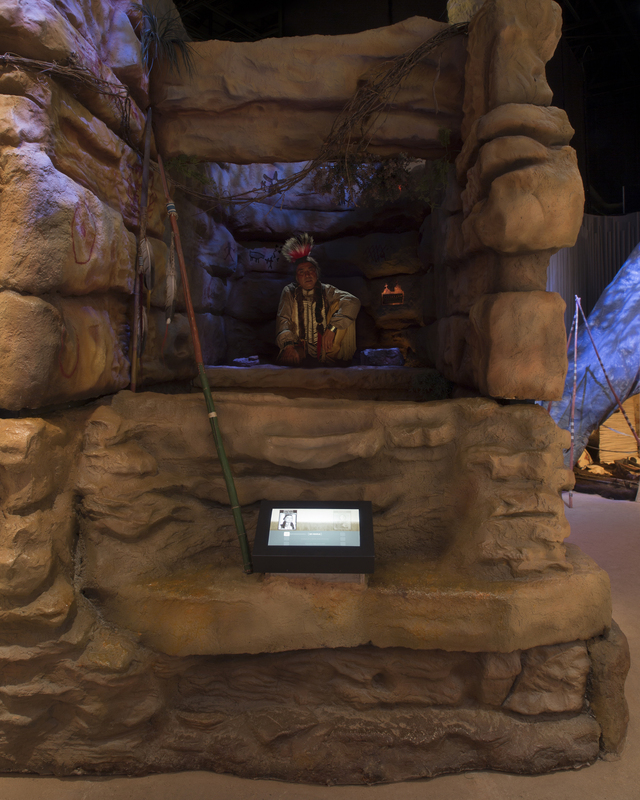 Information has educational games: Visitors can make decisions on frontier matters and see the consequences along with descriptions of life on the frontier among both settlers and Indians. This section even shows how to build a tipi or picket house, and offers a great deal of information on the weather and the land. Transportation has three sections: “From Trails to Highways,” “Frontier Horsemanship,” and “Wagons and Stagecoaches.” This section shows major trails of the pioneer days, the symbols Indians used in decorating their horses and the various wagons that were used in frontier days. Documentation has two sections: the Document Collection and Image Archives. The Document Collection has ads and newspapers from the era, along with letters (one from Sam Houston) and treaties with the various Indian tribes. The Image Archives has photos and original drawings of frontier towns, Indians (including most of the great chiefs and warriors), cowboys, the Army and buffalo hunters. This is a replica of a longhorn owned by Fayette Yates, who lives just south of Abilene. Amigo holds the record for greatest horn length, almost nine feet, and was 1998 World Champion Steer. Amigo will be a popular spot for a “photo op” – as well as a surprise for those who get too close. Based on a saloon in the Flat below Fort Griffin. The Flat was a very unruly place, a true “hell town.” Saloons, such as the Bee Hive, were very popular with the transients who provided an ever-shifting population for the Flat. At one time, there were 18 competing saloons. The rhyme over the Bee Hive door is authentic and was known throughout the West. The bar is roughly modeled after the actual bar that was in the Bee Hive, which can be seen today, in use, in the Bee Hive Saloon in Albany. had been killed. They sold Sharps “Big 50” buffalo rifles for about $50. Today these same rifles that were sold in the Conrad/Rath store will bring $50,000 and more from collectors. Charles Rath set up his first Texas trading post at Adobe Walls, an action that led to the famous battle of that name. He also established Rath City, a trading post between the present-day locations of Hamlin and Aspermont. cannon balls. The courthouse also served as the jail, and the cannonballs locked the stones in place, making it impossible for prisoners to dislodge them and escape. This is the glass-door gallery for temporary or changeable exhibits. It has 400 sq. ft of display space and will be used for exhibits that enhance the visitor experience in Frontier Texas! The opening exhibit will feature a photographic journey through the evolution of the site from junkyard to the present facility. A companion exhibit will reveal “behind the scenes” photos of the development of the audiovisuals and exhibits in the historical experience. Traveler Information Kiosks -- Information available for the counties in the Frontier Texas! region. The frontier region is roughly bordered by Ft. Worth on the east, the Cap Rock on the west, the Red River on the north and I-10 on the south. On the Traveler Information Kiosks, the default screen will be the region’s network of state and federal highways presented as “segments” reaching from Abilene to one of the cities on the perimeter of the frontier region (Wichita Falls, Ft. Worth, Fredericksburg, San Angelo, Odessa, Lubbock, Amarillo). Selecting a highway segment brings up its enlargement and maps of the counties the segment crosses. For example, the highway segment from Abilene to Wichita Falls crosses five counties. At the same time, a button bar will offer access to hotels, restaurants, museums, historical sites, attractions, RV parks, lakes and public golf courses in each county. Selecting a specific entity (i.e., hotel) will bring up a page on that entity with photo, descriptive copy and contact information. These Traveler Information Kiosks will be available for self-service, but the travel counselor’s station will have the same equipment. Staff there can lead visitors through the program. This trail drive sculpture, the focal point of the Visitor Center, was provided by First National Bank of Abilene. This is a real Texas longhorn raised by Fayette Yates of Abilene and donated to Frontier Texas! 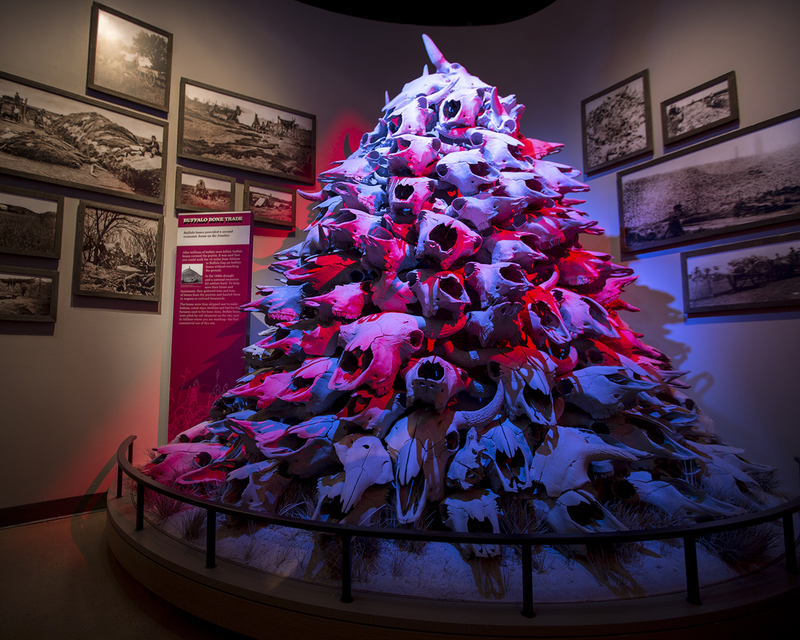 Fayette’s grandfather, Cap Yates, is credited as one of the individuals who saved longhorns from complete extinction in the early part of the last century. This steer died 10 years ago at the age of 12. He was a big steer, weighing about 1,600 pounds. His horn spread, tip to tip, is six and one half feet. Bugles are played hourly to replicate the signals given in a frontier fort. The life of a soldier was regulated by such calls, ranging from Reveille to Mounting the Guard to calls for drills and meals and other activities. The musical notations for some of the calls can be found on the Information Station. Heard within the lobby restrooms, a narrator and three children - Anglo, Comanche and Hispanic - will compare for visitors the English, Comanche and Spanish words for animals, family, greetings, counting and other subjects. Posey Liles of Lawton, Oklahoma, age 10, provides the Comanche language segments of the audio. Posey’s great great great grandfather, Ten Bears, a Comanche chief, is featured pictorially in Frontier Texas!, as well as being quoted on one of the Seating Stones in the Parade Ground. This link was unknown at the time Posey was selected. Yuliana Prieto, age 13, of Merkel is the talent for the Spanish words and Alex Warr, age ll, of Abilene is the English voice. Betty Hukill of Abilene and the Executive Director of the Paramount Theater is the voice of the announcer. The Visitor Center lobby will resonate with recordings of old cowboy songs, Spanish ballads and Comanche Pow Wow tunes. Additionally, songs will play that are available for purchase in the General Store. A retail area will offer Frontier Texas! and Abilene products, books, records and other items. Since Frontier Texas! is a facility intended to welcome, entertain and educate, the design of the building and site was approached with the idea that architecture should further these objectives. Since forts were a major part of the frontier experience, the decision was made to “echo” them. Extensive research into the organization and architecture of the original forts formed the basis for many of the major design decisions. The exhibit wing and other “storytelling” elements of the building are constructed of rough local limestone with minimal openings to suggest the construction of the frontier forts. The Visitors Center is treated in a more modern way with manufactured masonry units and large areas of shaded glass. The building elements form the edges of a large open area scaled to recall the parade grounds around which the frontier forts were organized. Planning for the site incorporated a new street connection, providing more direct access from the Interstate directly to the downtown area. Stones on the parade ground are arranged in the proper formation of a regiment at assembly. Schoolchildren standing on the stones can read the rank of the person who occupied that position and their duties. The stones also list the forts on the Texas Forts Trail and name the commanders who served at each of the forts. Six stones in front of the building and six in the Parade Grounds provide seating, but also convey first-person impressions of the frontier through quotes. They are arranged thematically. The chimneys are representative of many ruins of the frontier forts, but especially nearby Fort Phantom Hill, which was built and destroyed in the early 1850’s. Most of the structures were made of wood and all that remains of them today are the stone chimneys. “Cowboy Brown.” The sculpture contains a bronze heart inside the buffalo, a trademark of this sculptor. Exhibit design: Douglas Group, Washington, D.C.
Department and executive director of the McWhiney Foundation; Daniel Gelo, Ph.D., a dean at University of Texas at San Antonio and an expert on Indians of Texas; Bob Green of Albany, a rancher and long-time student of regional history; and Bruce Shackelford of San Antonio, a specialist in the physical culture of the frontier time period in Texas. In 1999, Texas department of Transportation announced a federal plan, the T-21 Reimbursement Program, and indicated that proposed visitor center facilities would be viewed with favor in the allocation of those funds. of Abilene had recently acquired. The stimulation of downtown Abilene was the core motivation in this project. An entity was needed that could increase downtown activity by attracting local residents and their guests as well as regional visitors and tourists – and in doing so might become an economic engine for other attractions and businesses in Abilene as well. The concept of a visitor center coupled with an attraction emerged to fulfill this need to increase downtown activity. In addition, the facility will help to provide exposure for Abilene and the newly resuscitated Texas Forts Trail as the communities of the region promote themselves to potential visitors. The attraction portion of the project evolved into a historical experience, a walk-through that would capitalize on the rich – though often unrecognized – history of the region featuring the real people who were involved in transforming this wilderness into our current definition of civilization. Thanks for reading all of this vast information about us!